The National Association of Commissions for Women (NACW) assists and supports commissions for women to ensure that they not only survive, but thrive in today's challenging environment. We provide valuable programs, meaningful activities, relevant resources, and available expertise to our members. Please become a member of NACW. We can connect you to other state and local women's commissions across the country to exchange information and ideas and to other women's organizations and national resources. Don't forget to follow us on Facebook or Twitter. Together, we can accomplish great things for women and girls across the United States! 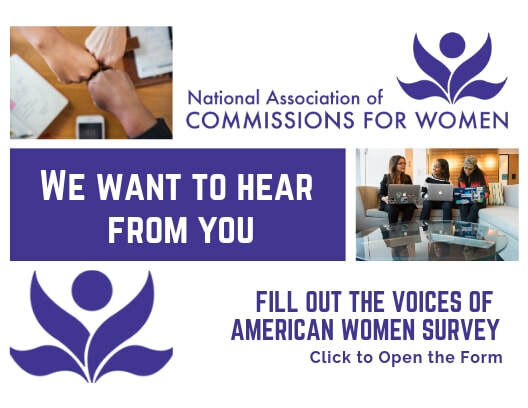 ​The mission of the National Association of Commissions for Women (NACW) is to sustain, strengthen and advocate for women’s commissions in their work to promote equality and justice for all women and girls and ensure they are represented and empowered in their communities.